Part of the Graffiti scribbled at the home. vulgar drawing in photo has been blurred out. Brooklyn, NY - Chasidic residents who say they have been subjected to repeated harassment since moving into a newly renovated three family home near Williamsburg woke up Saturday morning to find anti-Semitic graffiti scrawled on their front door. The incidents have been taking place at 59 Vernon Avenue, located on the Bedford-Stuyvestant side of the Marcy Avenue housing projects. Yehuda Kohn, who performed renovations to the property, said that Satmar Chasidim have been slowly moving southward as they look for housing in the Williamsburg area and that while he found most of the neighbors were welcoming while he was working on the house, someone is clearly less than pleased to welcome the three young Satmar families who moved in two months ago. The latest incident took place this past weekend. 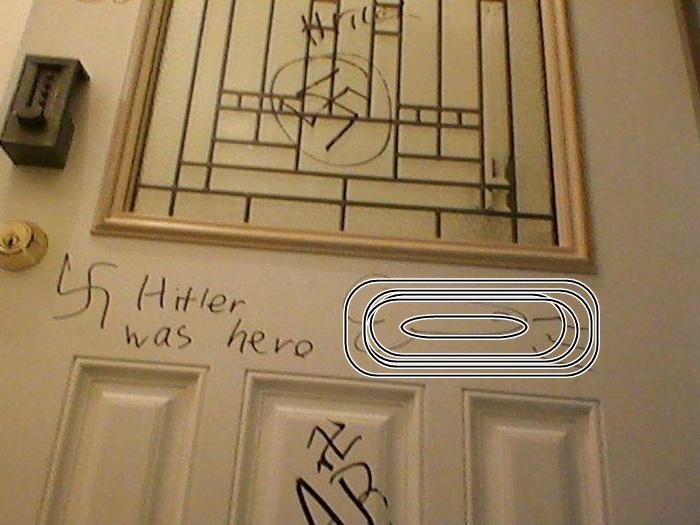 The graffiti included swastikas, the words “Hitler was hero,” and crude drawings of male genitalia. Police told VIN News that the incident was reported to them on Saturday evening by the 21 year old occupant of the second floor apartment who reported that someone had pounded on the door while shouting profanities. The NYPD’s Hate Crimes Task Force has been notified of the incident. Police said they could not say whether the incident was currently being investigated as a hate crime. Guess that's what happens when some of these people actually learn how to write. Why didn't they install cameras? ask mr deblassio - CRIME IS DOWN !!!!!!!!!!!!! You are blaming the victims? Not a hate crime???? So what do they call it, a love crime?? Moof arois fin dem villyamsburg..
Where are all their community & church leaders, showing up to scrub off the graffiti & to watch over the house? They should be dancing for joy, the Jewish neighbors aren't going to break in to cars, homes, mug old ladies & cause drive-bys. Their presence raises the status of this crummy neighborhood. Why are they ordering Chinese food at 3 in the morning? Great comments! I guess the welcome mat is only out to those who look as they do. Racism does work both ways, but our liberal leaning press, the Mayor and of course Herr Obama choose not to see it. This is Deblasio's NY. Only 2 more years until he is out of office. The Jewish folks are not ordering it. The harassers are. They can call and order c.o.d on food and then when the delivery guy comes to deliver they wake the family as well as end up with wasted food that no one really ordered.